Today is another digistamp from The Stamping Shack. This cutesie is called Brolly Girl or simply umbrella girl. It rained last week here in Doha and this digi is just perfect for the first rain in the year. The rain is almost like a brief shower not heavy as what we usually have back home but still good to have. The weather is starting to get colder as we reach December, soon it will feel more winter in here. 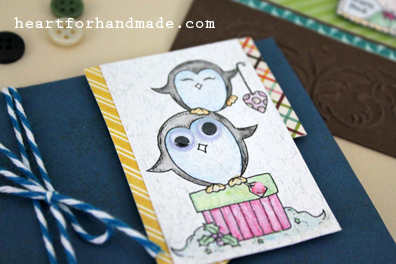 For today’s card, I colored her with watercolor pencils and use papers from Echo Park and Stampin Up! The ribbon came from my stash thread. Note that there’s still time to join the card challenge at The Stamping Shack, up until 8am GMT on 29th November so check the blog now to join in. You can check the details here for more info. And now off to my brolly girl. It’s been a while that I haven’t join Papertrey Ink’s weekly challenge. This week, I’m taking part on Make It Monday #92: Layered Vellum Die Cuts challenge. I used Papertrey Ink Stars die, die cut the vellum in several mid-size and small sizes then layered them together. The single layer vellum somehow gives a burst of rays around the full star isn’t it? 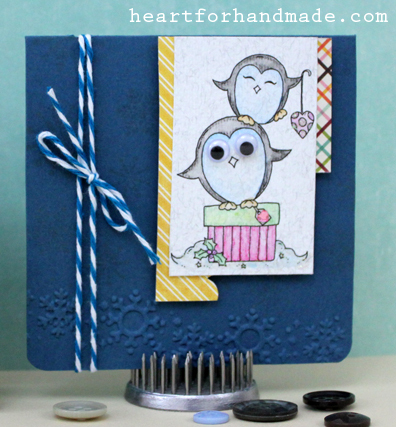 I stamped the background with musical stamp background as well as the tag. The tag is also a die I have from Papertrey Ink. 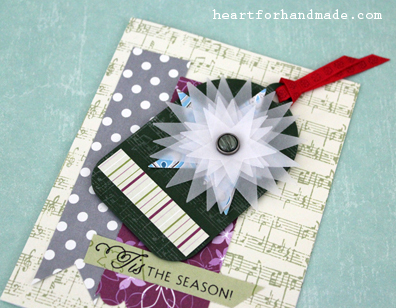 I’m entering the card to Pretty Paper Studio’s November challenge too. I’m joining in this week in Paper Smooches Sparks Challenge for Nov. 19-25 Cool Shades challenge. I use different stamp sets on this card. 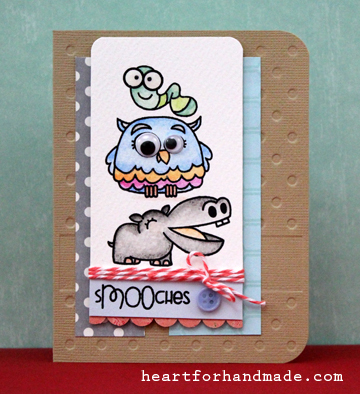 I wanted to give this illusion of the cutie animals together by putting them almost on top of each other, debossed the card base, and use minimal embellishment. For the coloring, I used watercolor pencils on watercolor paper. 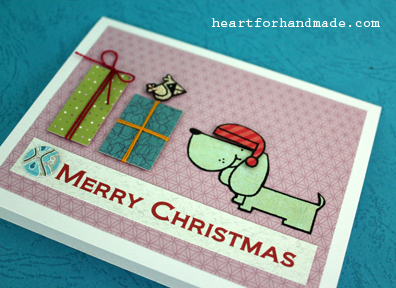 I had the chance to do a quick mini holiday card today using digistamp from The Stamping Shack. The digis are from the Lillliput and Cutie Tootsie collection. You can check the store for more adorable digis. 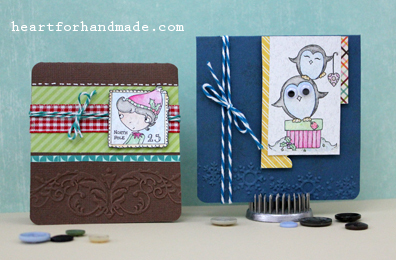 In both cards, I mainly embossed the card base using an embossing border folder from Sizzix. I colored both card images with watercolor pencils. For my winter penguin, I put a wiggly eye for some character, minimal embellishment using twine and patterned papers, a mini holiday card that I can easily put on top of a gift. I’m entering this blue card in CAS-ual Fridays, Winter Blues challenge, CFC 79. For the Lilliput digi, I made a more traditional look since I find the image resembles a vintage look into it. 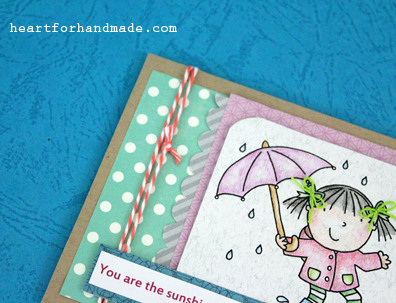 I used twine and ribbon for minimal embellishment again and embossing on the base of the card. Happy Wednesday! I can’t believe it’s almost weekend and already a week after the holiday bazaar. Where did time go? For the sentiment, I stamped Happy Holidays on to a banner tag, I did put an eyelet on the tag’s end for a little bit of interest. I used the sketch inspiration from Retro sketch # 38, and I’m entering my card there too for this week’s challenge. It’s been awhile that I haven’t join a card challenge lately but now it’s back to join the fun again. 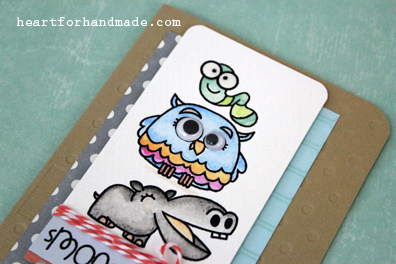 This time I used another digistamp from Stamping Shack called Feeding Chicks. More adorable digistamps can be found at The Stamping Shack shop so go and check them out here. There’s an ongoing challenge at their blog til the 29th of November so be sure to submit your entries as early as now so you’ll not miss the chance. Rules and prize are also at the blog. 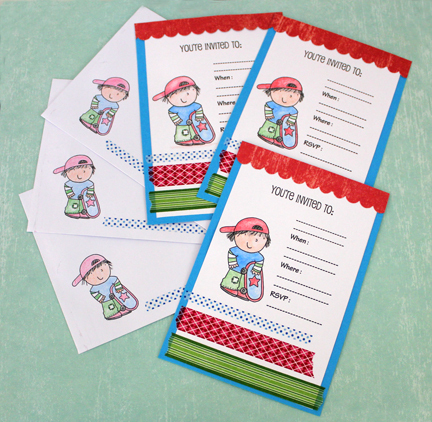 You can see my gift tag project inspiration there too using Cupcake Chef Daisy. For today, I used this fun Feeding Chicks digi, colored them with watercolor pencils and used minimal embellishments. This scene reminds me of our childhood days when we used to feed our native chickens with their little chicks. We don’t have a barn but life back then seems to be so simple yet fun. My dad used to get eggs from the mother chick in morning for breakfast 🙂 My brothers and I used to feed these chicks every weekend and whenever we had the chance. Oh I miss those days with my family..
And so, now, I’m entering this card at CAS(E) this sketch # 6 challenge. 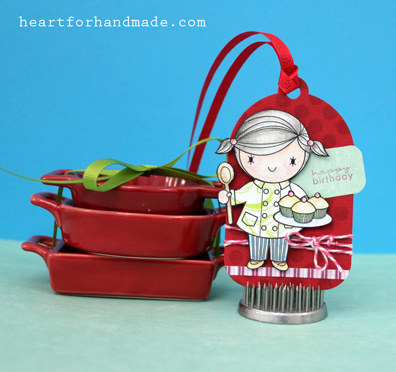 Anyhow, on to my project this week is this very lovely digistamp called Cupcake Chef Daisy which I used as the main character for my birthday gift tag. The image can be bought here at the Stamping Shack store. You can visit the blog too to join in this month’s first challenge with a theme “Anything Goes” and check out my other co-designers creativity. The challenge will run from 8am GMT today, 15th November until 8am GMT on 29th November. 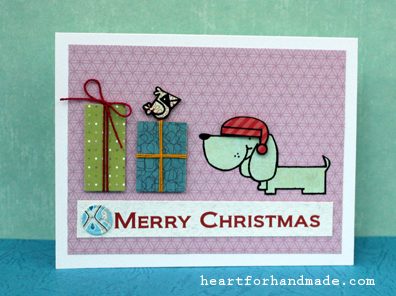 The winners will be announced at the Stamping Shack blog at 8pm GMT 29th November. Prizes are at stake for the winners so go check out the blog for additional details. For my Cupcake Daisy tag, I colored her with watercolor pencils, cut the image from the print then did another print of the same image on a pattern paper. The pattern paper enable me to cut her chef uniform. 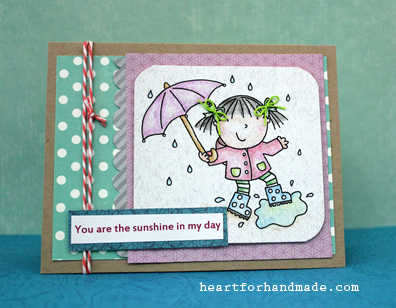 As for the background tag, I stamped it with polka dot bg stamp from Paper Smooches, Geo Graphic. 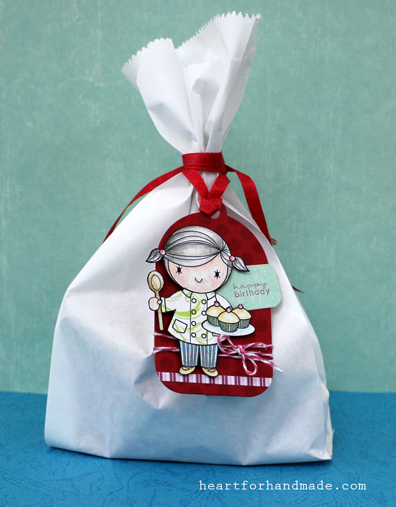 This red tag is just fit for the white paper pouch where I packed the small gift for a little girl chef. 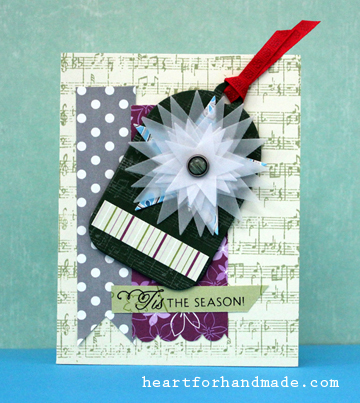 Now head over to Stamping Shack blog for more inspiration. 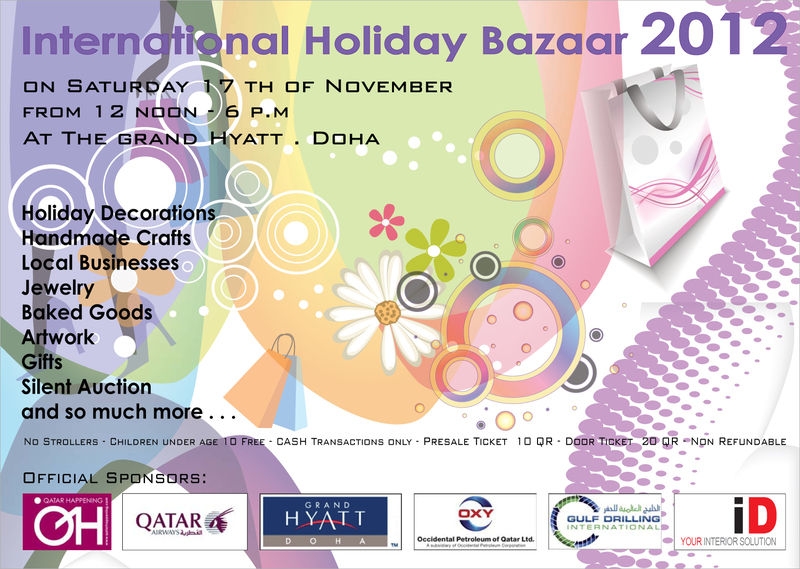 Heart For Handmade will be at The International Holiday Bazaar 2012, 17 Nov – Saturday, Al Silia Ballroom, Table # 72 in Grand Hyatt Hotel, Doha, Qatar. Can’t pass this week’s picture perfect challenge by Paper Smooches. I stamped the little doggie and bird on a patterned paper then cut each of them. The sentiment is printed from my computer, cut then tucked with a button. Gift boxes are from my extra stash, wrapped with crochet thread to give an illusion of a gift.